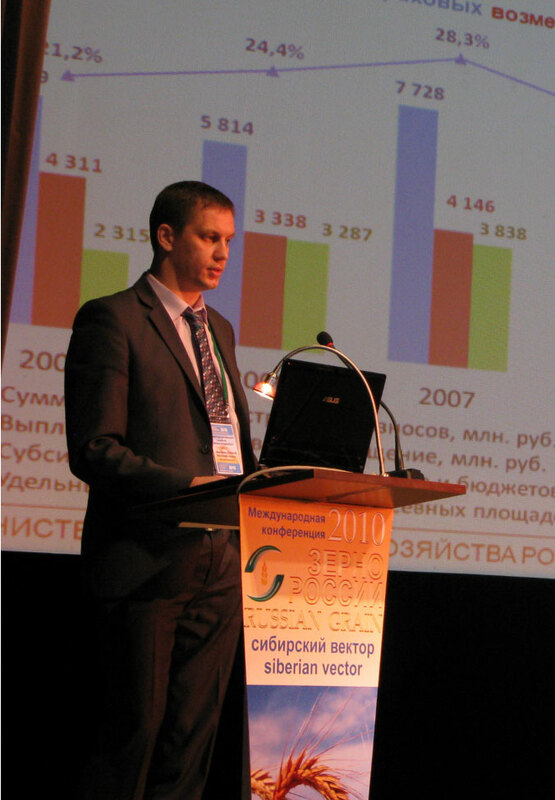 The Russian Grain Union under the auspices of the Ministry of Agriculture of the Russian Federation, Ministry of Economic Development and Trade of the Russian Federation, authorized representative of the President of the Russian Federation in Siberian Federal District and Authority of Novosibirsk region held the International Conference “Russian Grain 2010: Siberian vector” on December 6-9 2010 in Novosibirsk, Russia. Some 154 participant from 11 countries took part such as Kazakhstan, Japan, France, Bangladesh and Egypt. Presentations and reports are available in the Member Area of participant. The Russian Federation was represented by 30 regions and territories, starting from the Krasnodar territory and up to the Far East such as Altay territory, Khabarovsk territory, Tomsk region, Omsk region, Chelyabinsk region, Zabaykalsk territory, Irkutsk region, Krasnoyarsk territory, Republic of Buryatia, Kurgan region, Novosibirsk region, Kemerovo region, Primorsk territory, Republic of Tyva, etc. 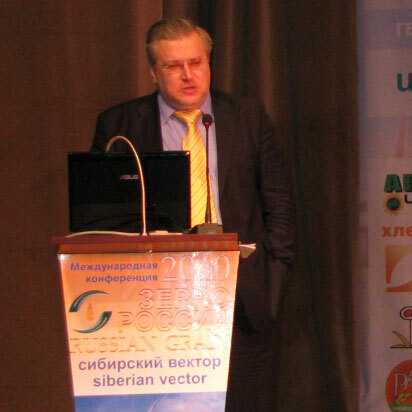 The Conference was opened by Mr. Akady Zlochevsky, the President of the Russian Grain Union. At the plenary meeting, Mr. Sergey Sukhov, Deputy Head of Agrifood market regulation and infrastructure development department, Ministry of Agriculture of the Russian Federation and Mr. Alexey Marchenko – Advisor to the Deputy Minister of Agriculture of the Russian Federation have provided a detailed analysis of the situation in agricultural sector and information about measures to overcome the post-effects of drought. The report of Mr. Artem Shashkin, Deputy Chairman of the Board, Rosselkhozbank JSC, was of particular interest and provided the development strategy and agricultural sector support. 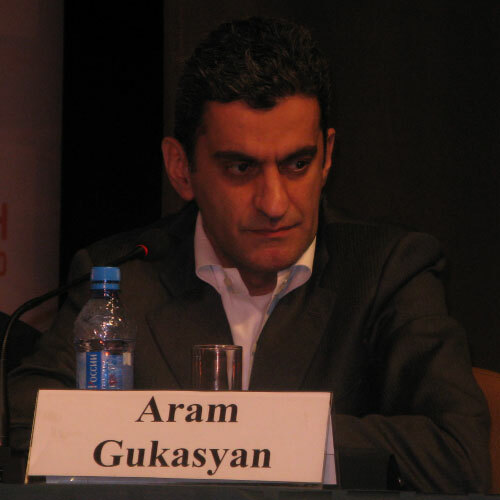 During the round table ‘Government regulation of agriculture – how to increase the efficiency’,where have spoken Mr. Artem Shashkin - Deputy Chairman of the Board, Rosselkhozbank JSC, Mr. Aram Gukasyan - Deputy General Director, United Grain Company JSC, Mr. Sergey Sukhov - Deputy Head of Agrifood market regulation and infrastructure development department, Ministry of Agriculture of the Russian Federation, Mr. Alexey Marchenko – Advisor to the Deputy Minister of Agriculture of the Russian Federation, Mr. Arkady Zlochevskiy - President, The Russian Grain Union, Mr. Alexander Korbut - Vice-President, The Russian Grain Union, Mr. Anatoly Nikitasenko - Non-profit organization ‘Association of efficient agricultural producers – Zauralye’. The round table was an active debate on the availability of credit resources, and proposed changes in the mechanism of crop insurance. In the active debate regarding the quality of Siberian wheat and its condition, trends, competitive potential and new challenges for producers participated Mr. Vladimir Petrichenko – General Director, ProZerno, Mr. Vladimir Belyaev – professor, Altay State Agrarian University, Mr. Sergey Derzhavin – Head of agricultural department, «SGS Vostok Limited». The session ‘Grain market situation: trends, scenarios, prognoses’ was of high interest for participants and during the session their forecasts, recommendations and estimates announced Mr. Vladimir Petrichenko – General Director, ProZerno, Mr. Valeriy Gachman – General Director, Grana CJSC, Mr. Aram Gukasyan – Deputy General Director, United Grain Company JSC, Mr. Evgeniy Gan – President, Kazakhstan League of Grain Processors and Bakers, Ms. Anastasia Androsenko – Deputy Head of Financial Market Control Department, Federal Antimonopoly Service and Ms. Anna Popova – Financial Director, SEUS CJSC. Lively discussion between participants called the analyst round table ‘Grain and flour market situation in the second part of season 2010/2011 and first estimates of yield 2011’, where took part Mr. Vladimir Petrichenko – General Director, ProZerno, Mr. Valeriy Gachman – General Director, Grana CJSC, Mr. Aram Gukasyan – Deputy General Director, United Grain Company JSC, Mr. Evgeniy Gan – President, Kazakhstan League of Grain Processors and Bakers, Mr. Arkady Zlochevskiy – President, The Russian Grain Union. There were announced the forecasts for grain price changes in the second part of season and first forecasts for the croppage of grain crops. 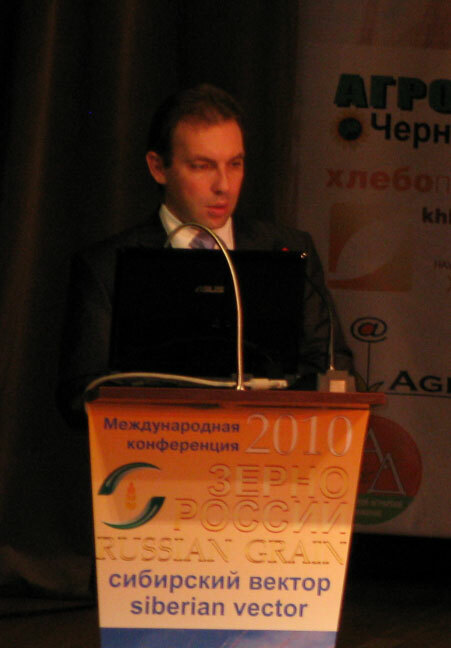 In the framework of plenary meeting ‘Siberian grain market infrastructure: current situation and problems’, where were discussed the burning issues of logistics and infrastructure of the Siberian federal district, as well as the possibility and necessity of state support to create Far-Eastern grain corridor for the advanced development of Russian grain market. In the round table ‘Searching for harmony in relations between railway and market operators’ took part Mr. Sergey Gomanyuk, Minister of Agriculture and Food, Deputy Chairman of the Government of Khabarovsk territory, Mr. Valeriy Gachman – General Director, Grana CJSC, Mr. Victor Khegay – Head of sales department, Rusagrotrans CJSC, Mr. Alexander Barteniev – Director, Contrail – Bait Siberia LLC, Mr. Viktor Pokotilov - General Director, Berkut Managing Company. There was an active discussion and, generally, a new contract of Russagrotrans CJSC for grain haulage in 2011 was supported by participants. In the course of business communication and along with a full-session program, the conference participants were offered the optimal conditions for negotiations, meetings with partners and presentations of their companies.